Another restaurant/cafe is planned to go in across from us in what was once a “waffle bar.” Sounds good, right? Wrong. The owner is a man that already owns/manages 3 or 4 restaurants, not successful by any other means besides basically having the only places to go in town. This is like Mr. Potter really getting his way in It’s A Wonderful Life. Let me explain more. Most (I can’t say all but am inclined to) of these places are overpriced with horrible food and when people joke about $7-9 pint night, no joke at this place. They are all over town and avoided by Greg and I while flocked to by many others. I have contemplated asking some of these folks what the appeal is. The one by our place has bad music most weekend nights, crabby employees, bad food and pricey drinks. The other doesn’t really have a place to feast and for the price, I would hope they’d pull out all the stops. I am begging someone else to try. The food is grotty, except for the food at the Indian restaurant and in that case, it is pricey. He just bought out a failing family restaurant/bar and turned it into a stuffy hole-in-the-wall, which sounds like an oxymoron but describes it to a tee. People flock to these locations as if they’ve never had decent food in their lives. My heart hurts. Did I mention this same man attempted to rent us a closet he called an apartment for 1.5 times the going price of a downtown place of the same caliber? After seeing it, he told us the price and when we said we couldn’t afford it, he called a meeting to offer us another one of his rentals-a basement in a house across town where nothing exists and there weren’t any windows for the “regular” rate of other full-size apartments with windows and more room. We avoided showing our faces in his places but we rarely see him and quite frankly, don’t think he’d recognize us…my beard is growing quite nicely these days. (I don’t have a beard, it’s a joke for those who do not quite understand my humor.) Our landlords are friends with this British man but we are suspicious of this codger. I looked that up on a British insult website and took it to mean a devious old guy. I hope I am right. Let’s sweeten this up with a bundt cake. 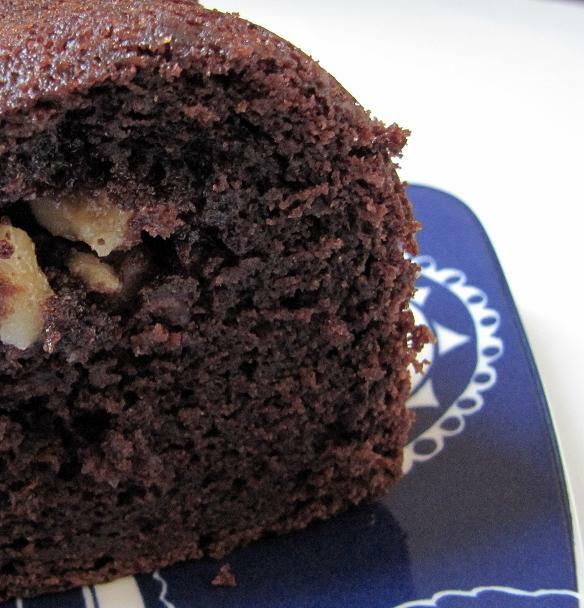 If you’ve ever seen My Big Fat Greek Wedding, you might say it as I do and if you have no idea what I am talking about, look at the picture of this chocolate bundt with a sweet walnut filling. Oooooh! Well, it was tasty but did not come out clean which is why my picture is kind of odd. I thought the cake might be dry so I found a filling to add with walnuts, brown sugar and butter. This was tasty and pecans could be used instead of walnuts or no filling at all. I think something raspberry inside would compliment the dark chocolate, maybe next time. This bundt was adapted from an Ellie Krieger recipe that was supposed to include espresso but I didn’t have any. Preheat oven to 350 and spray bundt pan really well if you don’t want to have what I had in the end, it had separation issues. Whisk in a bowl the flour, cocoa, salt, baking powder and soda and then sift into another bowl. In another bowl, whisk melted butter and oil, and then add eggs and egg whites. Fold in yogurt (or sour cream), vanilla extract and sugar. Melt the chocolate in the microwave in 30 second intervals, stirring after each interval. Fold it into the batter. Add dry ingredients and stir until combined, don’t over-stir the mix. Mix the melted butter, walnut and brown sugar together. Pour half of the batter into the pan and place the walnut layer on top of the batter and then top it with the remaining batter. Bake 35-45 minutes, until a toothpick comes out clean. Cool on wire rack in the pan for 15 minutes and then, flip it over on the rack. If it doesn’t come out, run a knife around the sides to help release. Remember, it still tastes great if it doesn’t come out clean and that it will work next time….that’s what I told myself. Top with the powder sugar by dusting it around if you wish.